We are delighted to announce the launch of our brand new limited edition print Trip by contemporary artist Vanessa Jackson RA. We met up with Vanessa in her studio to learn more about her work and creative routine. Tell us about your studio space - what is your set up? Are there particular things you need around you to work effectively? I am very lucky that I live where I work, my studio is below my flat and is quite large with beautiful light and tall ceilings..but can be very cold in winter so I wear a Marines padded boiler suit…. I keep the largest area dedicated to painting and keep the walls clean so that I can concentrate on the work. There are large plan chests on which I make drawings, collages and wood prints and a rather large storage area of older work… and an upright piano where I play very simple Bach and ‘arranged’ Chopin etc… very badly but I enjoy the shape and sounds and no one else has to hear me. Radio 4 is a constant companion… unfortunately I can’t listen to music as it is too emotive and breaks the concentration… occasionally if I am just doing clearing up jobs I can listen. Talk us through a typical day in your studio. Do you have a routine? You work on a variety of scales, often creating very large paintings. How did you find creating this postcard-sized work? I like to work on large sized paintings, over two metres… a bodily size that is about ‘real’ space and I also make small paintings which I feel are like looking through the wrong end of a telescope….space but in miniature.. Drawing and collage are important to keep things open and a different way of thinking or constructing, composition or spatial dynamics. Working on a postcard size is just another challenge… like painting plates, and I’ve even done an egg cup for charity. You were elected as a Royal Academician in 2015 and have of course featured in their summer shows, if you were asked to curate the summer show what would be your curatorial concept? Are there any contemporary artists or art movements you are particularly excited about? Recent contemporary artists…. Elizabeth Murray, Brice Marden Robert Mangold Agnes Martin…and closer to home, Stephen Cooper, Gill Ord, Tim Renshaw, Lee Maelzer,Mary Ramsden, Katy Kirbach…..and several hundred more…. A few group shows in Artist lead exhibitions this year, and the RA Summer Show…. and just ‘daily practice’. 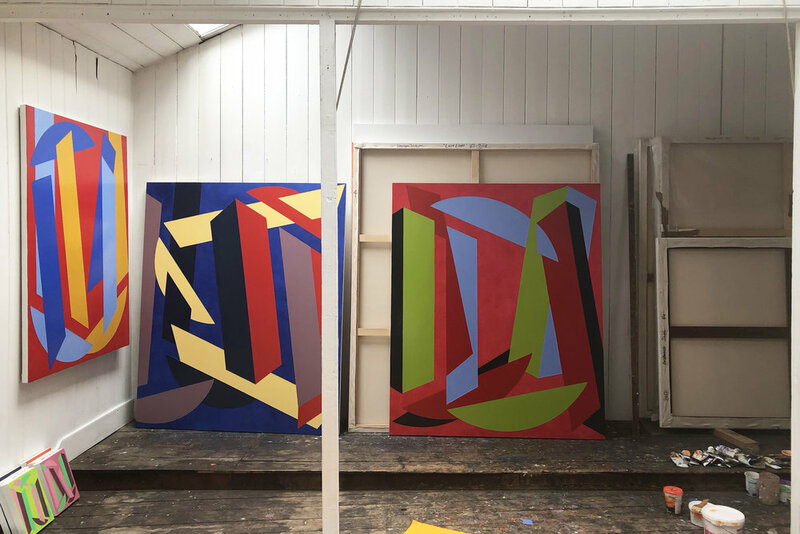 Vanessa Jackson is a painter and installation wall painter, whose use of geometry and its three dimensional function deny the supposed flatness of modernist space. Her work explores the contradiction of a fully realised space at once pertaining to logic and completeness and uncertainty and unease. The ornamental and optical play of colour and form in the artist’s work both confirms and confuses the sense of perception. Jackson studied at St Martins School of Art from 1971 until 1975, followed by the Royal College of Art. She was President of the New Contemporaries in 1975 and had her first solo show at the AIR Gallery in 1981. She undertook the Yaddo Residency in New York twice, 1985 and 1991. She was chair and then patron for Brazier’s International Artist’s Workshop until 2013. She recently won The Sunny Dupree Family Award for a Woman Artist for the RA’s Summer Exhibition 2015. 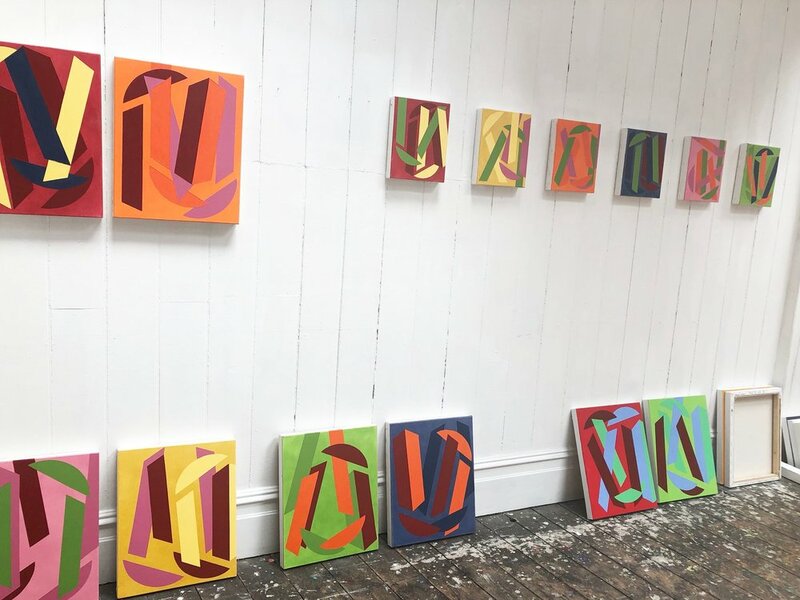 Her prolific teaching career has seen her serve as Head of Painting at Winchester School of Art for nine years, as MA and Research Tutor at the Royal College of Art for fourteen years and as a Senior Tutor at the RA Schools for fifteen years until 2013. She is presently on the Edwin Austin Abbey Council and the British School at Rome Fine Art Faculty, for which she was previously awarded the Abbey Fellowship in 1995. She is included in Painting: Documents of Contemporary Art, published by the Whitechapel and MIT. Jackson lives and works in London.